Alive @ Five @ Zandy’s! 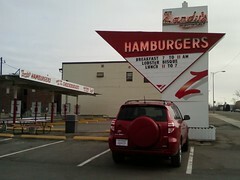 You are at:Home»Great Falls Montana»Alive @ Five @ Zandy’s! Don’t forget: Alive @ Five is tonight, and this week it’s going to be centered around Zandy’s! The 1100 block of Central Avenue will be blocked off, and there will be food, games, and live music (band is Hired Guns, I think), starting at 5:00 tonight!